Starting From Zero by Fred Lam – SCAM? 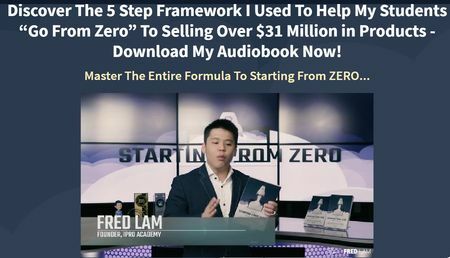 Just heard about Starting From Zero by Fred Lam and wondering if it is a scam? You have landed at the right place. He is claiming he has a proven 5 step system that has created $31 million in sales for his students! If it was so fantastic, why is he selling it at only $1.99? And why are his affiliates fervently promoting this product as though their lives depended on it? How much commission can they get out of a product that costs this little? We will answer these questions and more, here in this honest, unbiased, and in-depth review of Starting From Zero by Fred Lam. I am not promoting it, so you are in safe haven here, and can be assured of my objective opinions. Let’s dive right in now, to take a look at what method is taught in this audiobook that has allowed a grandma with zero technical knowledge to become a millionaire (in his exact words). 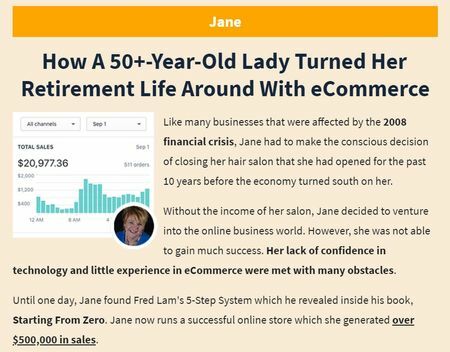 Starting From Zero by Fred Lam is an audiobook and PDF file that teaches about the ins and outs of building an eCommerce business from scratch. There is some value in the training if you are a complete beginner. Though he tries to cover many aspects, I find that they lack the depth necessary to bring you real success just by relying on this product alone. There will be pricey upsells that will be marketed aggressively to you, as that is where the money is made. In addition, there are issues inherent in the dropshipping model, which I cover in detail in this article (also in these other related products that I have reviewed, like Uduala, xPress Funnels, and Bank Ramp, to name just a few). Read on for the detailed review of Starting From Zero by Fred Lam, and why I do not recommend it. Let’s first take a look at the information presented in its sales video and landing page. This guy, Fred Lam, supposedly found success through eCommerce businesses, selling physical products, and ultimately specialising in buying traffic. So he devised this simple 5-step system that anyone can use to start building up their own eCommerce business from scratch. And he wants it to be affordable to everyone who needs it, thus the low price of $1.99. Here is a candid review of this product, by a real user, which makes for quite an interesting read. I do not understand. What kind of platform is this, such that it can actually display the real time results of his students? Or are these just some numbers that he typed out himself? Am I sensing some dishonesty here? Anyway, I want to point out for a fact that in any eCommerce business, ‘sales’ or ‘revenue’ does not mean profit. You have to take into account the costs of starting up and operating the business. Things like cost price of the products, which will make up a huge bulk of this ‘sales’ figure, because you do need to pay the suppliers. Then we have the huge advertising cost, to drive traffic to the online store, as well as the monthly subscription to an eCommerce platform in order to run the store, and so on. Of course I’m speculating here, but this $31 million in sales could in fact be not able to cover the costs of the businesses, such that people are making losses, you never know until you see the real picture, which he definitely will not show here. How much can we believe him? Fred Lam just wants you to see and hear the good things, so that you would buy into his product. In the sales video, he claimed the training made a grandma a millionaire. Even if she really did make over $500,000 in sales, remember the actual profit could be very far from this figure. Advertising costs could be huge and scary, depending on how far you take it. So to me, the sales video and sales page are providing very misleading information, just to get people to buy into this cheap product. The low price of this training is definitely going to get him huge volume in sales. Now he will have the massive targeted audience to aggressively market his expensive upsells, claiming that those training will get you even more targeted traffic, make you more money, etc. If you do a simple search on this Fred Lam, you will see that he has launched other products before. If his training is so good, why does he not just focus on one and build upon it, improving on it, and letting his reputation build up as word gets around for his fantastic course? Why would he have to sell training for roughly the same content under different names? If it is something that can stand the test of time and real customers’ feedback, why does he not create a platform for the entire community of his students to come together, interact and learn from one another? And why does have to hang such big carrots in front of his affiliates, to get them to fervently promote his training? As you do your research for this product, you will find plenty of raving reviews about it. Affiliates are promoting it like their lives depend on it. It is because Fred Lam is offering crazy prizes in the affiliates contest: two cars to be won (a 2019 Ford Mustang for first prize, and a 2019 Ford Fiesta for second), Rolex watch, MacBook Pro, and so on. It is obvious the amount of hype he intends for the marketing of this Starting From Zero. Besides the fact that I don’t really trust this guy, based on what I presented in the previous section, there are also issues inherent of the dropshipping model that you need to be aware of, before you jump into this business. In dropshipping, you set up an online store for customers to purchase products in your chosen niche. On the back end, you would have negotiated with some suppliers to purchase those products from them at some wholesale or discounted price. When customers make a purchase, you send the order to the supplier, who proceeds with the delivery of the item directly to the customer. In this model, you do not have to sink in an upfront investment to first purchase the products. You get payment from customer first, before getting supplier to process the delivery. That lowers your risk. You are acting as the middleman, so you get middleman profits, which is naturally very low, as the supplier will take the bulk of the revenue, considering they are the ones creating the products and doing all the hard work. eCommerce is becoming a very competitive market these days. Not to mention the giant online shopping platforms like Amazon, eBay, etc. So you need a competitive edge in order to attract people to buy from your store, instead of going to other online stores, or those big shopping giants. The single most important factor customers will consider is definitely the price of the product. If you mark it up too high, nobody buys from you. Too low, the profit is not worth your time and all the effort. It also means you need to do market research, to know your niche sector well, look at how other people price similar products, in order to gain the knowledge and experience to price the products in your store competitively. Besides having to take the middleman’s profits, you have to deal with middleman woes, sandwiched in between your customers and suppliers. The sales transactions take place between you and the customers directly, whilst you are relying on the suppliers’ work ethics and efficiency to get the items delivered to your customers on time and in good condition. When disputes arise, you will have to take the brunt of your customers’ wrath, while pushing (possibly) incompetent suppliers to get things sorted out. To me, that’s not a very comfortable position to be in. And that is why dropshipping is not for me. No one will come to your store until you pay for advertising to get traffic. In Fred Lam’s training, one of the focus areas is about using FaceBook ads to drive targeted traffic to your store. The thing about paid traffic is the high cost, and high risks associated with it. Forking out the money does not guarantee results. Worse yet, the traffic that comes to your store is not converting into buyers, because you do not know how and where to find targeted audience who will respond positively to your products. Paid traffic is not something that you can learn from the books. It takes doing to learn. Which means you have to actually run advertising campaigns on your chosen platform, study the results of the campaign, tweak some parameters, run another test, analyse it some more, tweak some more, run some more, etc. You could be thousands or tens of thousands of dollars in the red, before you start to see some results. It is a steep learning curve, no matter which platform you choose. It is also too risky for me. Now, I want to show you the business model that I am using to make my online income. It is very low risk and low cost. The business model I am using is called affiliate marketing. I find this to be the best, because it is neat and hassle free. To put it very simply, I promote other people’s products, since there are millions of existing products and services that I can leverage on. When customers click on my affiliate links to buy the products, I earn a commission from the retailers or the suppliers. The sales transactions take place directly between customers and the retailers or suppliers, I do not enter into the sales agreements. My role is only to drive business to these retailers, and I get rewarded with a percentage of the sales that they make because of my promotions. With this model, I do not have to deal with customer complaints or refunds, or any delivery, or even storing or owning any products. It’s all handled by the retailers themselves. Plus, I have the huge advantage of being able to drive free traffic, unlike using an eCommerce platform, where you need paid traffic if you want to make any sales. By virtue of how I get the free traffic, I am also paving the way to building a passive income stream. This is something that the free traffic will continue to be channeled to, every single day, allowing me to make commissions, even when I stop working on it. Fred Lam is successful in his own right, for sure. The fact that he is standing in front of his product does make it credible, knowing there is someone accountable for it. There is definitely relevant stuff you can take away from the training, if you are really keen on starting an eCommerce business. I personally do not like the sales tactics he uses, including using huge sales figures to make people think that this is such a great opportunity, and using crazy prizes to create a state of frenzy selling among his affiliates. If you choose to make use of this business model, you would have to deal with the very high cost of this business, including advertising fees to drive traffic to your store, cost price of the products to be paid to your suppliers, and operating cost of the online store on an eCommerce platform like Shopify. On top of that, your selling price cannot be too high unless you want to kick yourself out of the market before you even start. Time and effort is needed to research on how to price your products competitively. Inevitably you would have to deal with customers complaints about late delivery, or spoilt goods, and then you would have to settle these with your suppliers, including any replacement or refunds. The upsells in this product are quite hideous. It is no different from many other digital products that are created to dig as deep into your pocket as they can. Once you purchase the front end product, you will be bombarded with these upsells, even before you get a chance to try out the product and see if it works for you. What does that show about how much Fred Lam cares for your well-being? 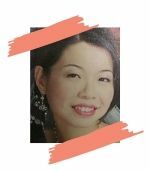 Upsell 1: $147 for 3 months + $49 monthly – eCompreneur, a 12-week training where you see Fred Lam literally mentors someone (not you) through the process of becoming an eCommerce entrepreneur. Plus access to some automation tools that you may not really need. Upsell 2: $197 – Influencer Masterclass by Connor James, who is a successful 7-figure Instagram expert, also Fred Lam’s top student. Is Starting From Zero by Fred Lam Scam or legit? It is definitely a legitimate training for eCommerce. But the business model itself is not something I would recommend, plus his sales tactics make me question his integrity and transparency in marketing his business. I do not recommend Starting From Zero by Fred Lam. 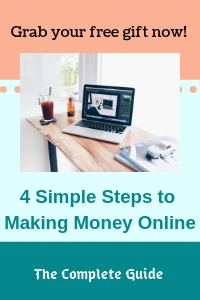 If you want to make some serious money online, that can be built into a full time income and more, let me show you the method I am using now. It is very low cost, low (virtually zero) risk, and allows you to build a free organic traffic source that will land on your offers, without having to spend a single cent on any advertisements. If you have any concerns or questions regarding this Starting From Zero review, do comment below, and we will start a conversation from there. Does American Cannabis Summit Scam You? What is OnPoint 2.0? Another SCAM? Great content. I really like blogs like yours, and much more post like this. I was looking around for some reviews of starting from zero by fred lam. Thank God that there are people like you which tell us what is scam and what is real. I really enjoy reading your post, because it’s so easy to read and much more easy to understand. Great. I like reading your articles, Joo! I am a newbie in this online business adventure and your expertise gives me valuable information and knowledge. 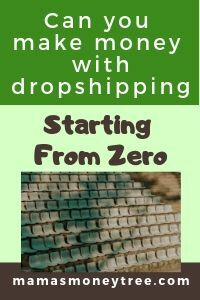 I’ve finally understood what dropshipping is! Yay !! Great information! Thanks for your compliment! I’m so honoured.